Here is a list of Civil War vets, which begins with a sentence fragment about John N. Gere being the first Civil War veteran buried here. There is then a list of all who were buried to date. There were two such lists published. The second was by M. H. Marble, who died in 1940. The date of neither entry is certain. 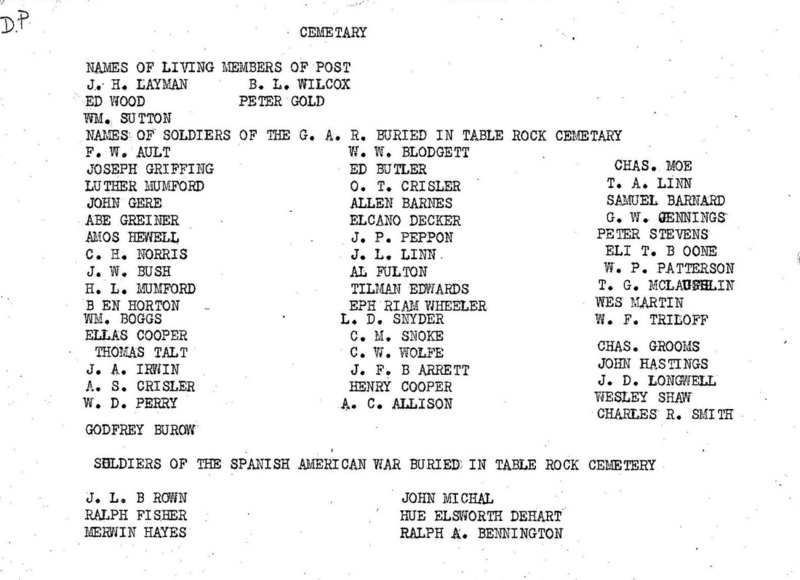 The names on the first list: John Gere, S. Barnard, J. L. Linn, Capt. Thomas A Linn, Eli T. Boone, Thomas Tait, Benjamin Horton, J. F. Barrett, Tilman Edwards, Elias Cooper II, L. Mumford, Geo. W. Jennings, Ephriam Wheeler, Joseph Griffing, Elkahan Decker, W. W. Blodgett, Luther Mumford, and Ephraim Wheeler.